Commercial air conditioning systems are incredibly hard working and make it possible for business owners to keep their clients and customers comfortable. 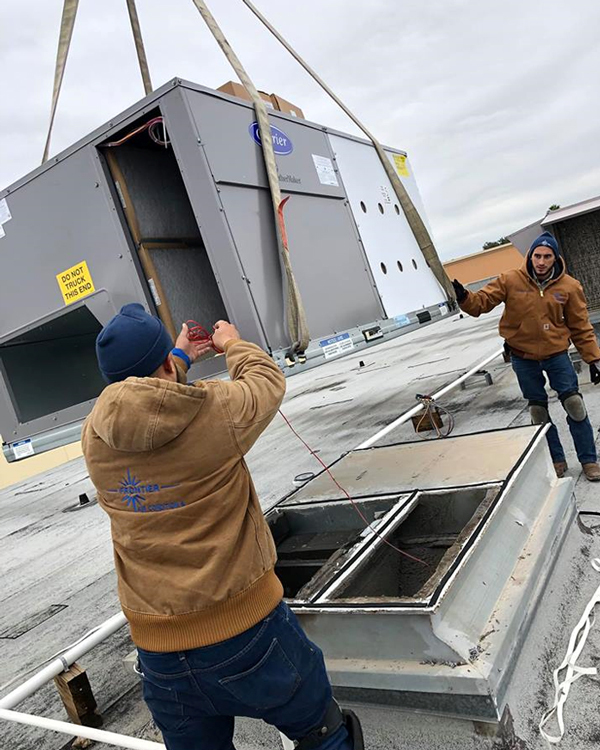 At Frontier A/C, we are happy to support many businesses across southern Texas with world-class commercial air conditioning system replacement. We have more than two decades of experience in HVAC, and we would love to help you out. While repairing an old HVAC system may seem cheaper than buying a new one, this isn’t the case in the long run. Worn-out systems require more and more maintenance while running a little more inefficiently every day. This means that you’re losing twice the money. Don’t let this happen. Instead, determine what it will take to replace your system. Our NATE-certified team will install your new system and set you up for years of comfort. Best of all, you’ll see the savings immediately. We understand that replacing a commercial HVAC system is completely different from changing out a residential one. Many times, the work is more extensive and the units need to be bigger — and therefore more expensive. This doesn’t need to be a problem for you. The Frontier A/C team is happy to offer financing solutions that empower you to move your business forward. Contact us to learn more today.